OK, we have an inductor now. Tip: setup Timer 1 for Freq and Phase correct PWM (.... no, not fast PWM ...), no pre-scaler. 1. If the AVR goes mad (program-error or so), and it drives the pin connected to the Gate high .... we are in trouble: the only limiting factor in the equation for the current is the resistance of the coil: 0.2 ohm ? and Rds-on of the FET: 0.8 ohm. Hmmm. that gives a lot of amps. So we add a fuse in line. 2A, normal speed rating is OK.
2. The almost 5V height of the pulse from the AVR is barely enough to drive the FET full open. It would be nice to have some higher pulse. We're gonna use it for both considerations as mentioned above. It's setup as a monostable of 40 - 60 us, non-critical value. When OCxb of the AVR goes high, it releases /Reset via T1, and T2 generates the trigger. Set Adjust for 0 us pulsewdth. Power on. 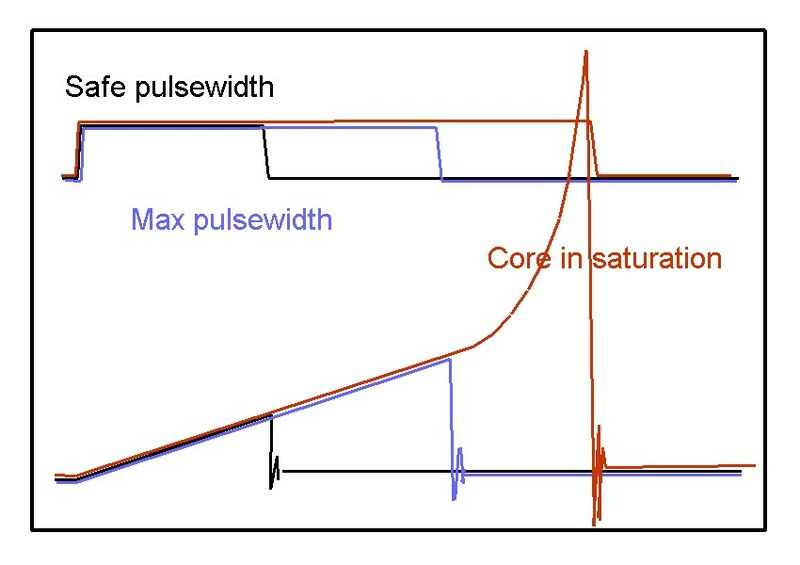 Check functioning of AVR and NE555; vary pulsewidth with Adjust. Of course you can use the dummy-load-resistors instead of a nixie-tube ! Set Adjust to zero, and put in the fuse. Now let's see if we can get the inductor into saturation: this is just to show the phenomenon of what core-saturation does!! Read the max. voltage of the line in straight-mode ;). Divide by Rsource, and the saturation-current is known. No need to worry for blowing Fets and/or other components: the repetition-rate is low,and keeps things safe. After this learning-experience (was it fun? ), time to move on to the final design. Make a resistor-voltage-divider from the 180V to appr. 2.5V. Adjustable if you like. 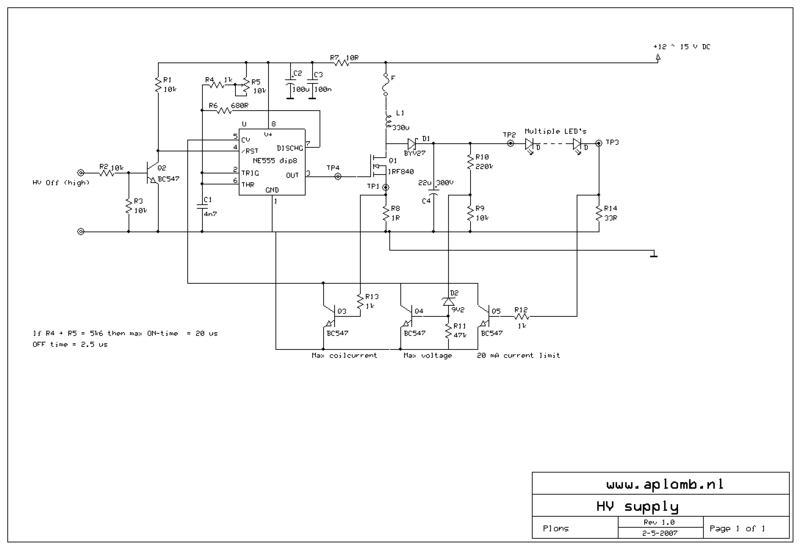 Feed that voltage into the AnalogComparator-pin of the AVR. The other pin of the AnalogComparator can be connected to some reference, but why not use the internal bandgap ? Timer0 is IMO more expendable than Timer1, so Slons uses Timer0 for this purpose. Rsource can be left out, but it's a nice thing to have there in the debug-phase. Q. No feedback with ADC? A. Nope. To keep the feedbackloop PDQ, the Built-in Analog Comparator is (IMO) much better for this purpose. Q. Does it require calibration for each production-unit ? Q. Do I need to compensate for changes battery-voltage ? A. Hmm. Depends. If you use the max. batteryvoltage when a charger is connected, i.e. 16.8V, and use that in the math above, you're safe .... and even better: we did not take the voltage-drop over the Fet's Rds-on into account yet, so using 15V as Vdd in the equation is fine. Q. That 22 uF HV capacitor .... is that a critical value ? Q. Is a heatsink required for the Fet ? Q. Is the Schottky-diode a limiting factor ? A. Yes, I think it is. 1 Amp average is the rating (IIRC), and we're looking here at an average of 1.3 A, and what's worse: the repetetive current. Consider this option: use two Fet's, two Schottky's, two inductors (re-calculate for 40 mA output!). The PWM-driver can stay single (the poor sod ....) , and the HV cap as well. Yeah, I know .... it's [in-line assembly of] Bascom. Not very popular on Freaks, but nevertheless: you can see what needs to be done, and re-write in the language of your choice. Q. : Isn't this design a bit ..... how shall I put this ..... over-killed ?? Some more thoughts on the output capacitor: even the fast responding control-loop with the analog comparator cannot keep up with variances in the 180V if a small output-cap is used. Let's assume that the Sodoku has been solved, and all the Nixies are turned off, while a moment ago they were all on, so pulsewidth is @ maximum ( I know I know, there is headroom ), then the controlloop will ramp back as fast as possible to correct for that raising 180V. It takes 255 pulses ( 5.1 ms) to get down do 0 pulsewidth .... linear step down. With 22 uF the overshoot will be 13 V .... with 1 uF ...... brrrrrr ..... do not even THINK of the consequences ..... 81 flash-tubes .... orange .... disaster !! This explains why my Slons 180V PS doesn't mind if I change the load from Zero to teh Max: it has that 22 uF cap, and the max. current is 10 times lower (of course). Slons doesn't even blink it's HV-eyes ;) when the dummyload is connected or removed. Interesting stuff this is huh ? Of course there are other ways of solving this issue. You could, f.i. modify the interrupt-routine Pc_emmer to set the pulse-width to maximum if the 180V is too low, and turn the pulse off if the 180V is too high. So instead of the decrements and increments. Even with a 1 uF the max. ripple would be just a 2.2V. But personally I wouldn't go for 1 uF. The NE555 is in a-stable mode. Q2 is there to control the HV-supply. The interesting part is in the bottom-part: might look a bit overdone (again ;) .... but wait: this version is for engineering purposes, and several safeties are built in. Q3,4 and 5 control the CV-pin of the 555: when the output is active, the voltage over C1 rises to the level of CV ( 2/3 of Vcc). By lowering the voltage on CV we can reduce the ON-time. 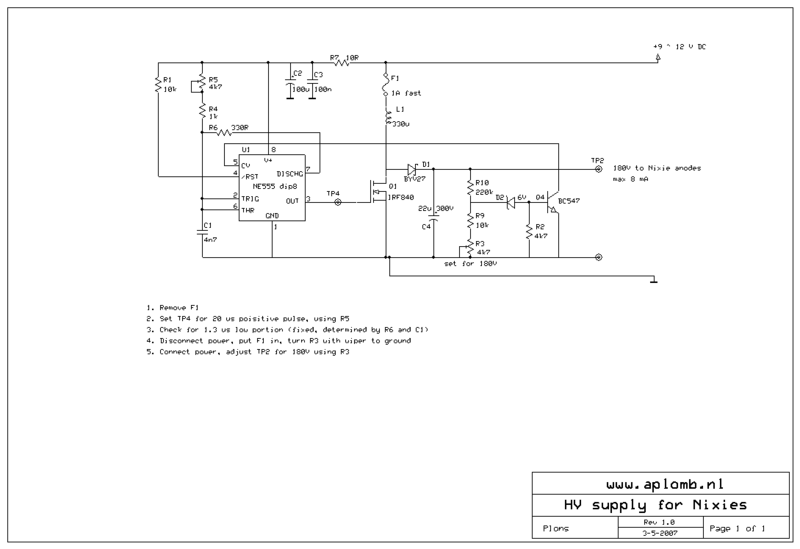 Q5 is the current-regulator: @ 20 mA through the LED's, the voltage across R14 turns on Q5, and turns of the ON-state of the 555. Questions so far ? PM me. Have fun and be carefull !! 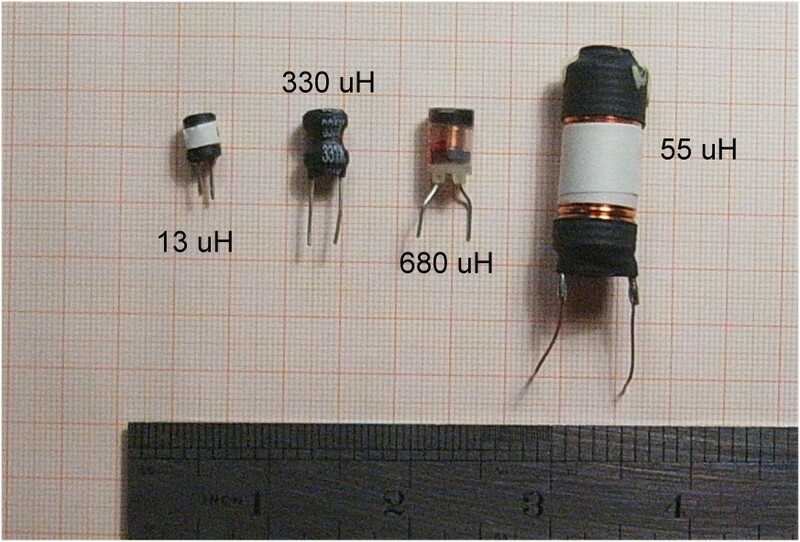 A picture of the 330uH inductor can be found when you scroll back this page.